Born to a Kansas City musical family, upright bassist Joe Martin often sees his music career through a familial lens. His third and latest album, Étoilée, was named for his young daughter. There’s no denying the hookup felt and heard in Étoilée’s lyrical material, whether due to shared musical bonds or the fiery kinetic energy that ensues when four of New York City’s top players—here recorded by renowned engineer James Farber at Sear Sound—merge souls and sounds. 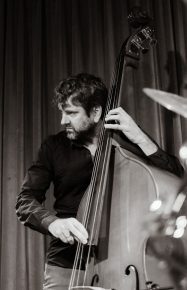 Currently working with the groups of Chris Potter, Mark Turner, and Gilad Hekselman, Martin has been busy practically since the day he arrived in New York in 1994. His résumé includes stints with Vinicius Cantuária, Bill Charlap, Art Farmer, Aaron Goldberg, Ethan Iverson, Ivan Lins, Brad Mehldau, Ben Monder, Jane Monheit, Anat Cohen, Kurt Rosenwinkel, Donald Fagen (on the Sunken Condos album), and vocalist Andy Bey, whose guidance was especially meaningful for the now 48-year-old musician when he was initially finding his way. Valued for his deep tone, quick ears, harmonic elasticity, and beautifully clear solos, Martin offers sage advice for any musician hoping to develop his or her sonic signature, regardless of their instrument. Hoping to strengthen his identity as a leader and eventually work with Herbie Hancock, Martin knows why he’s one of the first-call bassists in jazz.